Homemade beauty projects are one of my favorite things to create on a weekly basis. 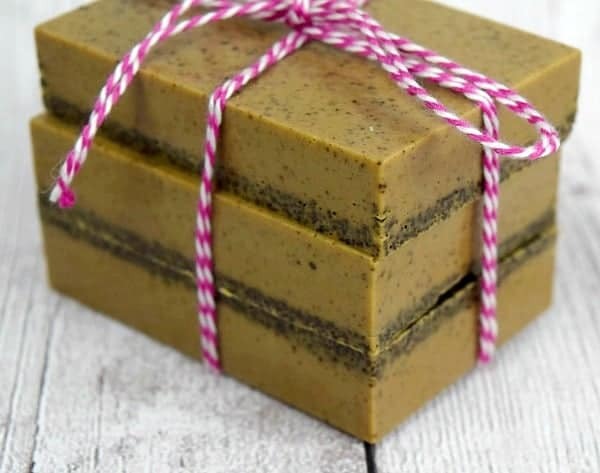 These homemade soaps are gorgeous and will look great in any bathroom or kitchen! Create a few for yourself and give some away to your loved ones. They also make excellent homemade gifts for the holidays as well. The strong aroma of coffee is perfect for everyone and you’ll be in love. Enjoy. 1. Cut up 4 large sized cubes and place in a microwave safe glass bowl. 2. Place in the microwave for 1 ½ minutes and remove. 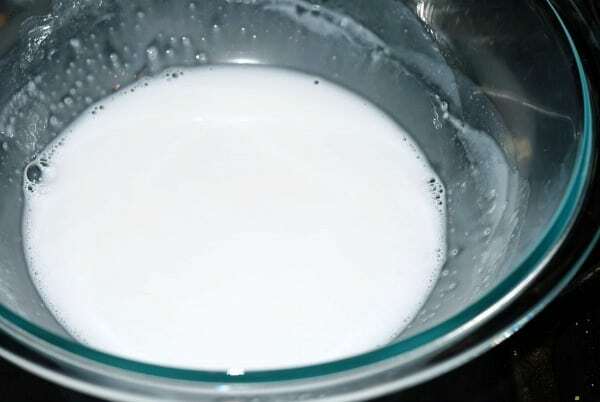 Once you remove from the microwave, give it a good stir and make sure all the melt and pour soap is melted. 3. 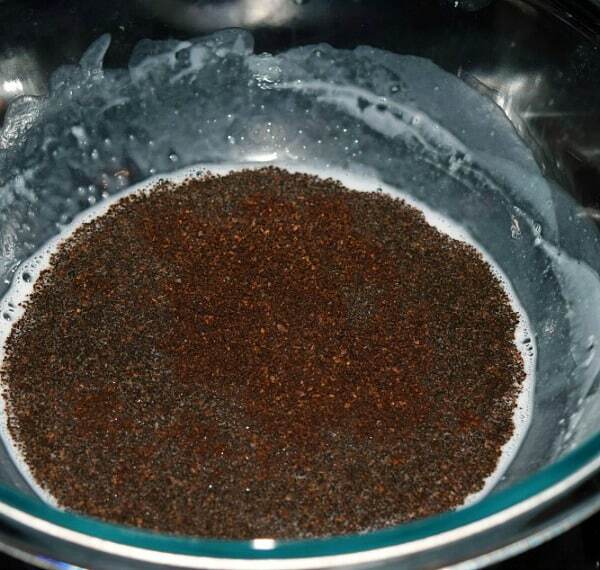 Add in your coffee grounds and mix well. You’ll notice the coffee grounds stick towards the top of the soap but it’ll all blend you pour it into the silicone mold. 4. 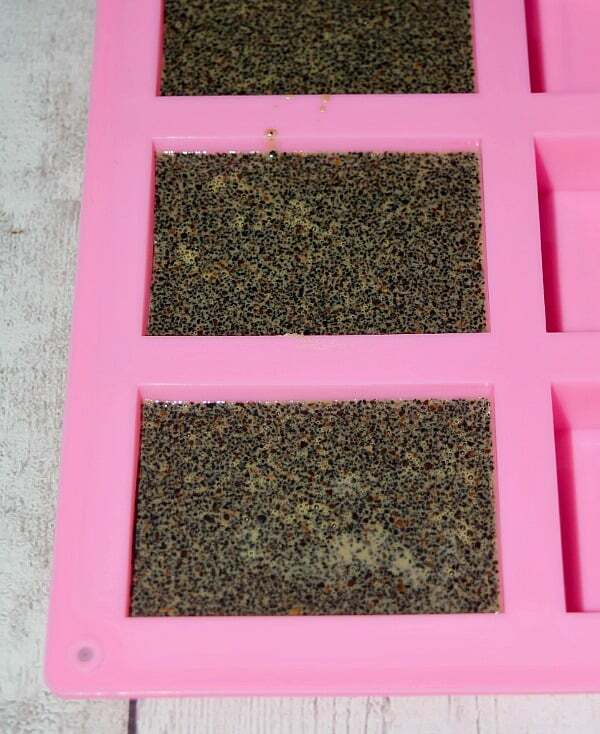 Pour mixture into soap mold. 5. Allow to set in your mold for 2 hours or more and then remove. You’re soap is now complete and it looks fantastic! For more DIY beauty products check out these recipes for Peppermint Lip Scrub, Homemade Coffee Sugar Scrub, DIY Dry Shampoo for Brunettes, Homemade Lavender Bath Salt and DIY Coffee Body Scrub. So I imagine this is good for exfoliating and it looks super cute but I am not sure I would want to smell like coffee….Is the smell very overpowering? I bet these smell delicious! Im going to have to make some of these to enjoy whenever I get a chance to have a warm relaxing bath! Thanks for sharing. This soap sounds like fun to make and will be useful as well. This would be a great gift idea! Thanks for sharing! I love this! I can’t wait to try it. Thank you for sharing. What a great DIY project. This would make a great gift for the coffee lover. Thank you for sharing this craft post. This soap looks amazing! I would never think of using coffee in soap. So cool! This really does look super, do the coffee grounds actually work as an exfoliate or are they just there for the smell? Where did you get the soap forms from, if you don’t mind me asking? I had no idea that making soap could be so easy. Thanks for sharing. I don’t think there is anything I love more than coffee and the way it smells. I can’t wait to try this! Can’t believe how easy this looks to make. I didn’t know that it is so easy to make soap. I think I would like the coffee smell, as long as it rinses off pretty well. oh, this looks great! I am going to try this. How easy…I love it! I always thought it was a lot harder with a lot more steps. This uses simple products. Plus, I’ve heard of several benefits of coffee for your skin. 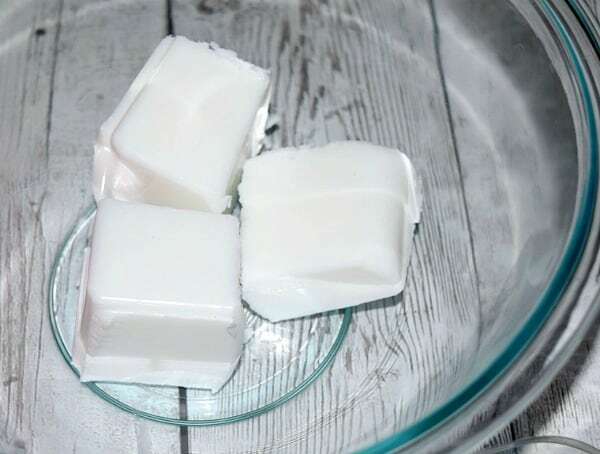 I have always wanted to try and make homemade soap. Going to have to see if I can find the Melt and Pour soap base. How cool is this! And it looks so easy. Got to make this. I saw this post and had visions of trying to make it and posting a “Nailed it” fail post about it, but this really looks so easy to do! Who knew! I love homemade gifts. I find people appreciate them so much more. I have been wanting to do something like this forever! I can’t wait to try it! I be the coffe makes a great exfoliator too! Wow, that is so easy! I can almost smell the coffee through my tablet! Thanks for sharing! 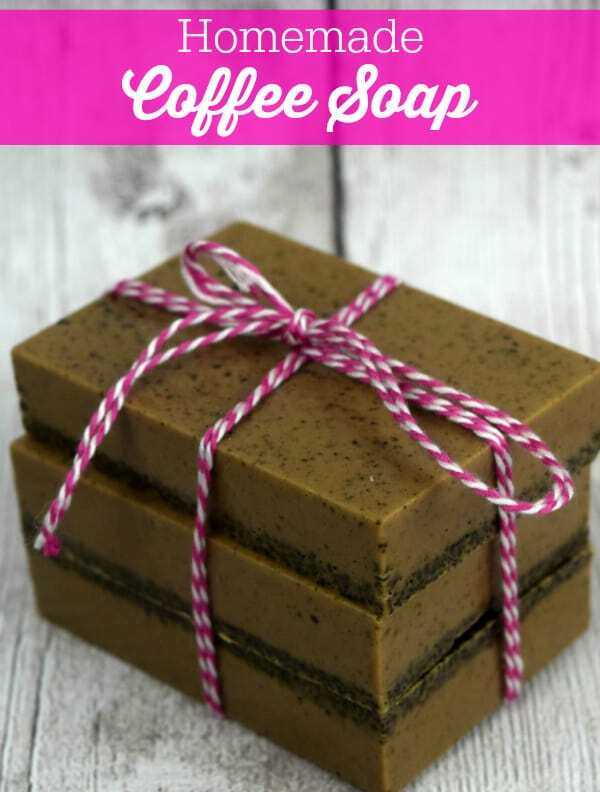 I love the thought of coffee soap! I used to wake up to the scent of my Mom’s coffee every morning and miss the scent as I don’t like coffee as an adult. I have to give this craft a think about! This looks so nice! I’d love to make this as a gift. Ooh, this looks great. 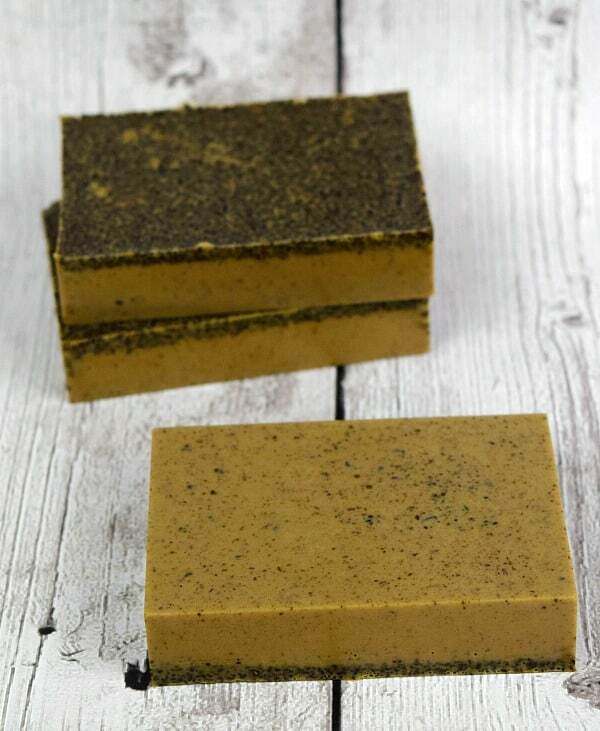 I’d love it with one of those delicious hazelnut coffees that smell amazing – I love the smell of them, but I don’t actually drink coffee myself, so I maybe I could use this soap instead. I love this idea! I’m totally a coffee-holic and this looks so fun 🙂 I was just looking for some ideas to do for teacher gifts and these would be perfect. Pinned it and thanks for sharing! I love the smell of coffee. I definitely need to make this soap!